April 25, 2010 - On May 8, Zero Gravity Corporation's (ZERO-G), G-FORCE ONE will blast off from Fort Lauderdale Hollywood International airport offering a once in a lifetime opportunity, introducing flyers to new heights and to defy the law of gravity. Guests will have the unique opportunity to float freely and lighten up in complete weightlessness onboard ZERO-G's weightless flight. ZERO-G is the first and only FAA-approved provider of commercial weightless flights. ZERO-G is a rare opportunity that only a select few have experienced calling it amazing and life-changing. The Weightless Experience is an extraordinary and exciting luxury travel adventure. 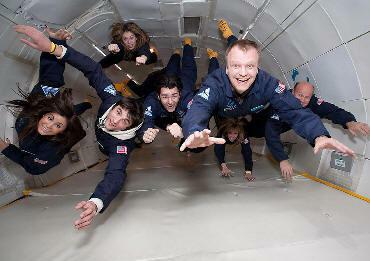 It is the only opportunity on Earth for the general public to experience true "weightlessness" without going to space. ZERO-G will provide unparalleled opportunities to guests throughout Miami. ZERO-G guests will receive Pre-flight training to maximize their ZERO-G experience, private transportation to/from FLL Airport, ZERO-G flight suit and patch, post-flight re-gravitation party, weightless flight award certificate, the chance to experience the rare and exalted state of weightlessness, etc. The weightless flight is a luxurious and private journey that offers guests the chance to float like an astronaut. The exceptional adventure allows guests to fly like Superman, flip like an Olympic gymnast, and enjoy 10-times more hang-time than the world's best basketball player. It's not simulated; ZERO-G replicates the same levels of weightlessness enjoyed on Mars (1/3-gravity), the moon (1/6-gravity), and zero gravity. It's an experience unlike any other. Nicole Kidman, Keith Urban, Martha Stewart, Joey Fatone, Ozzy Osbourne, Rob Dyrdek, Beatrice of York, Professor Stephen Hawking, Billy Bush, Gavin Newsom, Burt Rutan, Miles O'Brien, and cast members of "The Apprentice," and "The Biggest Loser" are just a few notable passengers who've flown with ZERO-G and proclaimed it to be one of the most thrilling experiences of their lives. This is the identical weightless flight experience used by NASA to train its astronauts and used by Ron Howard and Tom Hanks to film Apollo-13. Flights last approximately two hours and deliver 15 separate weightless experiences, each lasting about 30 seconds. This is twice the amount of weightless time achieved in a typical sub-orbital flight into space. Zero Gravity Corporation is a privately held space entertainment and tourism company whose mission is to make the excitement and adventure of weightlessness accessible to the public. ZERO-G is based in Vienna, VA and is the first and only FAA-approved provider of weightless flight to the general public, as well as the entertainment and film industries; corporate and incentive market; non-profit research and education sectors; and government. Founded in 1993, ZERO-G is led by a world-class team of veteran astronauts and experienced business leaders. The company was co-founded by X PRIZE Chairman and space visionary, Dr. Peter H. Diamandis; veteran astronaut, Dr. Byron K. Lichtenberg, and NASA Engineer Ray Cronise. The team spent more than a decade working to bring the marvel of weightless flight to the public. Since launching the ZERO-G Experience in September 2004, the company has conducted more than 225 weightless flights and flown over 6,000 members of the public, including celebrities and media personalities, corporate charters, science and math teachers, and individuals age eight to 93. ZERO-G operates under Part-121 with its partner Amerijet International of Fort Lauderdale Florida. Aircraft operations take place under the same regulations set for large commercial passenger airliners.